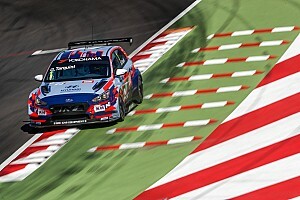 The opening WTCR race in Vila Real has been suspended after a huge crash on the opening lap involving polesitter Rob Huff and teammate Mehdi Bennani. From second, Bennani got a better getaway than polesitter Huff and the two ran side-by-side through the first sequence of corners. Huff appeared to have got his Volkswagen Golf GTi ahead approaching the first big braking point, but as the pair went through the Turn 5 right-hander the right-front corner of Bennani's car touched the Huff's left-rear of Huff's, turning Huff sideways at high speed. 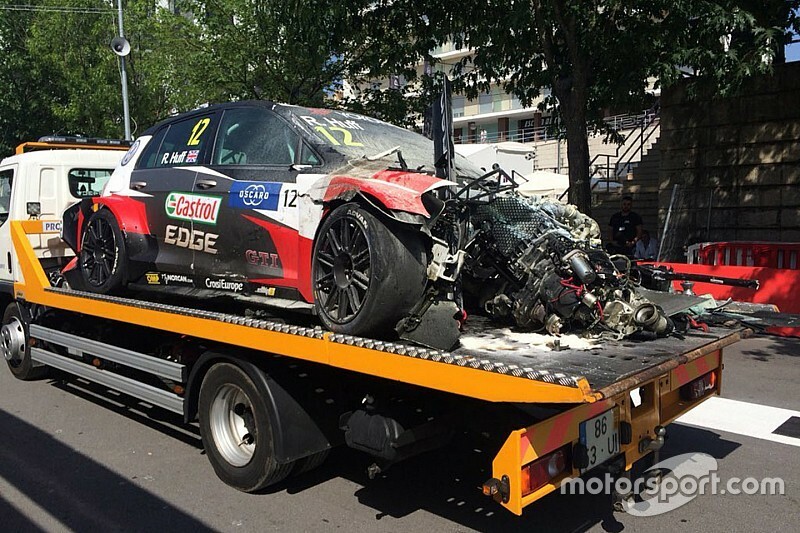 As the pair hit the outside barrier, his car was spat back out and into the path of Norbert Michelisz, with Bennani's car landing on the bonnet of Huff's and then blocking the road. That caused a chain reaction behind, with a fire briefly breaking out at the front of Thed Bjork's YMR Hyundai i30 N.
Bjork was able to step from his car and later signalled to fans as he walked back towards the grid. The race was immediately suspended as a result and emergency and recovery vehicles have started to attend the scene. A lengthy delay is expected as work to retrieve the damaged cars and to repair the barrier Huff and Bennani hit begins. "From what I saw it was Rob and Mehdi colliding," said Michelisz, who was hit as Huff speared back into his path but was able to make it back round to the grid again. "I experienced a big push from behind, my car went sideways and I couldn't avoid [being hit]. "I'm a bit angry because without the hit I could have avoided it. It was a big impact but nothing serious from my side." James Thompson, who jumped from his car to attend to Bjork's after he spotted the fire, said: "I think the first two guys came together and then they just blocked the track and everybody concertinaed. "I obviously had a big accident and hit the back of Yann's [Ehrlacher] car, but the thing that worried me was one of the car in front was on fire."